Rain date is September 9, 2018. 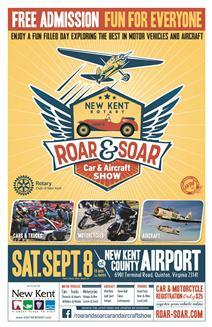 This event is sponsored by the New Kent County Airport and the Rotary Club of New Kent. Onsite attractions include: war birds, class, contemporary home built and light sport aircrafts as well as cars, trucks, motorcycles, muscle, vintage, street rods, sports, choppers, and cruisers. Rain date is September 9, 2018.